We had originally planned on updating the guest bathroom at the same time as the kitchen but we couldn’t bring ourselves to rip it out and create another project for ourselves, not to mention that’s where we were washing all the dishes! We went back and forth several times. I was ready to put it on the back burner and address it another time and because we were already living in a mess Steve wanted to rip off the bandaid off and finish the bathroom. As the kitchen drew closer to completion and we knew the dumpster would soon be picked up from our driveway we made a decision at 10pm on a Saturday night to start ripping it out. 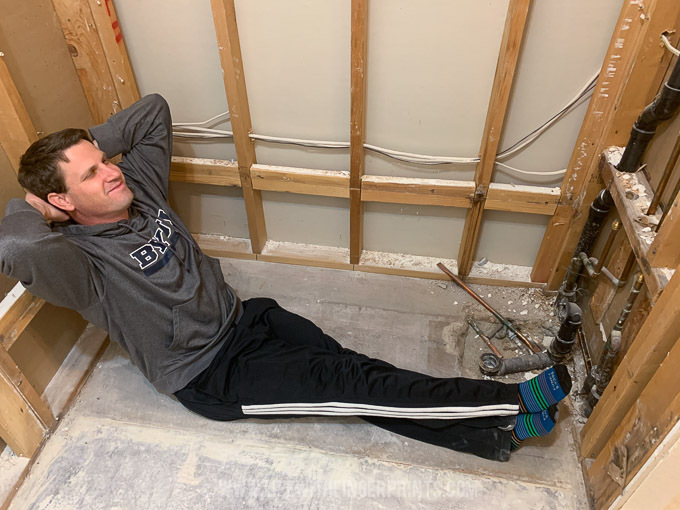 Although we’re currently farther along than the picture portrays – I just made a list of every step that needs to be completed to finish the bathroom…and we’ve got a ways to go. I like making step-by-step lists because it helps me take smaller bites of the elephant. But the list can also be a little overwhelming because it reminds me that I’m eating a whole elephant! !